Yeeco - Great for diy electric fan, solar wind blades or other models. Use appropriate power output can drive the propeller perfectly. Diameter of the hole: 1. 9mm. Material: plastic size: - Propellers φ: 80mm - hole φ1. 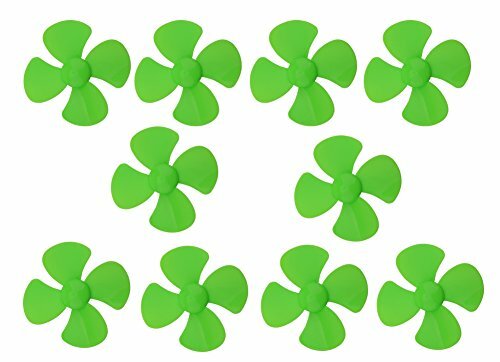 9mm application: can be used with 130 mini motor with 2mm shaft; DIY electric fan, solar wind blades, vehicle models Package include: 10xPropellers 10-piece propellers with 4-Blade design. Diameter of the propellers: 80mm. Yeeco B1700540 - Our mini motors body size:25x20x15mm/09"x08"x06"lxwxh;2mm/008" shaft diameter and 7. 5mm/03" shaft length. Parameter: rated voltage: dc 3v output speed: 16500 RPM under condition of 3V Motor Body Length: 25mm/09" motor body Height: 15mm/06" motor body Width: 20mm/08" shaft diameter: 2mm/008" shaft Length: 7. 5mm/03" rated voltage: dc 3v rotating speed: 16500 rpm/second under 3V No-load Current: about 350mA under condition of 3V Locked Rotor Current: about 1. 3a under condition of 3v package include: 10 x 130 dc motors 10 pieces a pack mini dc motors; Color of the motor body:Siler+Orange;Rated voltage: DC 3V. Micro 130 DC Motor, Yeeco 10pcs Mini Dc Motor DC 3-6V 16500 RPM Cars Toys mini Electric Motor High Speed Torque DIY Remote Control Toy Car Hobby Motor, Metal Car Engine Motor Kit for Toys Models DIY - Yeeco 130 mini electric motor;rated speed:16500 RPM under the condition of 3V, the motor owns small size but with high speed. This motor kit; application: it is perfect for mini fan, remoto control cars, electric toys, science experiments DIY and etc. The toy cars electric motor kit can tolerate DC 3-6V wide voltage range; This motor can be powered by 2-4 AA batteries or solar panel. Previous Post:PETRONE , CoDrone Propeller Set Black, 4pc set.